Scentings is a small company specializing in handcrafted aromatherapy products with charming packaging and literary themes. 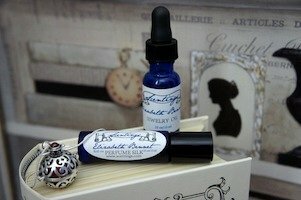 Two of Scentings' essential oil blends, Emma Woodhouse and Elizabeth Bennet, are inspired by the heroines of Jane Austen's novels. I've tried Elizabeth Bennet, named for the leading lady of Pride and Prejudice; it's an all-natural mix of clary sage, palmarosa, ylang-ylang, lavender and bitter orange. My first impression of this blend is the earthy, slightly musky clary sage — clary sage has plenty of personality, and it tends to dominate a bit here, so you'll need to like clary sage if you're going to love this blend. However, it is lightened by the floral-herbaceous lavender note, a citrusy edge of orange peel, and the warm, woody-floral palmarosa. The various oils or notes are combined smoothly, so that the result is a sophisticated blend, with a certain amount of depth from the more intense ingredients. Overall, the scent feels relaxing yet strengthening. ...Elizabeth continued her walk alone, crossing field after field at a quick pace, jumping over stiles and springing over puddles with impatient activity, and finding herself at last within view of the house, with weary ankles, dirty stockings, and a face glowing with the warmth of exercise. For me, the definitive adaptation of Pride and Prejudice is the BBC television series of 1995, so when I read this passage I can only picture actress Jennifer Ehle cheerfully tramping through rain-damp grass under a sunny sky, on her way to visit her new neighbors (and their haughty guest Mr. Darcy). Scenting's Elizabeth Bennet oil suits my mental picture quite well, since it's earthy but shot through with brightness. Scentings offers its Elizabeth Bennet in two formulations: Perfume Silk (essential oils in a base of coconut oil) and a more concentrated Jewelry Oil to be worn in an accompanying scent-necklace. The Perfume Silk is offered in a deep-blue glass bottle with a roll-on dispenser. The Jewelry Oil is packaged in a similar dropper bottle and is meant to be applied to small limestone beads that are then placed inside the openwork silver pendant, which acts as a small diffuser. The set, enclosed in a book-shaped box with two pretty lavender sachets, would make sweet gift for a friend who loves Austen and enjoys natural fragrance or aromatherapy. Scentings' Elizabeth Bennet Luxury Set ($79) includes a dropper bottle of Jewelry Oil (10 ml), a roll-on bottle of Perfume Silk (10 ml), a silver-plated aroma-charm pendant on a silver-plated chain, two limestone beads to use inside the pendant, and two decorative fabric sachets filled with lavender. The Perfume Silk is also sold individually ($18). Thank you, Jessica for the review. How very romantic! It’s the sort of thing I would have gone for 20 years ago. I think the pomander pendant would make a lovely gift. It’s a lovely idea, isn’t it? And the “book” box, which even opens like a book cover, is a nice touch. This sounds interesting, and the prices are reasonable. I got very interested in aromatherapy about 15 years ago, and I like all of the notes listed for this. Maybe a Christmas present to myself? I am a firm believer in the idea of a Christmas present to one’s self. I very much like the idea of diffuser lockets like this. One could avoid any skin sensitivities or competition with sunscreen, etc., and it would be easy to raise the locket to the nose for a more intense hit. Theoretically, one could change beads for a different scent on different days. Plus, this one looks very pretty. I love that you were able to pinpoint a scene in the book to illuminate this perfume! I have come across perfume lockets before, but often they were not well made or were too small to be a really nice piece of jewelry. I am 5’9″ and full-figured, so I do not wear tiny little pendants. According to the website, this one is about 1″ in diameter, which is a nice size, and on a silver chain, not a piece of black cord or something, and it looks nicely crafted. They also sell extra beads, which would make it easy to change scents from day to day. The pendant is light in weight but substantial in size, just as you figured from the measurements! I own a brass (?) pomander necklace from another company, in a similar orb shape with perforations, and I’ve really enjoyed it over the past year or so that I’ve owned it. It didn’t come with beads, so I usually just spritz a bit of cotton ball. It’s a very pleasing way to wear fragrance, for all those reasons you’ve both mentioned! Well, actually, I thought of the scene in the BBC series and then found it in the book. But the series is so faithful to the book that it’s easy to work either way! I notice in the video, she states that it is a limited edition. I also saw on the website that the Emma Woodhouse scent is “Out of Stock”, so perhaps that was a limited edition as well? In any case, I suppose if I am going to get this for myself, I shouldn’t wait too long. Aha! See below… Scentings’ owner has just paid us a call. I really like the pendant idea. For someone like me who has trouble getting fragrance to last that might be perfect. Most fragrances don’t seem to last very long on me, either. Having some in a pendant keeps the experience going! Of course, nothing is *quite* the same as perfume on skin, but if the necklace warms up through contact with the body, it does give nice results. Late to the party here, but just wanted to say thank you Jessica for this review! I’m so happy that we are in agreement that the BBC version of P&P is THE movie version that is the truest to the book and the movie for which all others will be compared to! I really appreciate that you found the right scene to match the scent! As a die-hard fan of anything Austen, and particularly Elizabeth Bennett, I cannot wait to try this and Emma Woodhouse too. I’m so glad you enjoyed it!! I feel very passionately about that BBC series. It’s the *only* adaptation, for me.